Chandigarh/ Ludhiana: The Punjab police have recently arrested five persons, including a UK Sikh citizen and all of them are arrested in FIR No. 193/16 registered at police station Baghapurana. As per the available information this FIR pertains to recovery of some weapon and the police have also added some sections of Unlawful Activities (Prevention) Act- commonly called UAPA. The information could not be verified with documentary proof because the police have ‘missed’ from uploading the FIR one website of relevant police district. Interesting the Baghapurana/Moga police web portal has skipped this particular FIR from it’s online public resources. 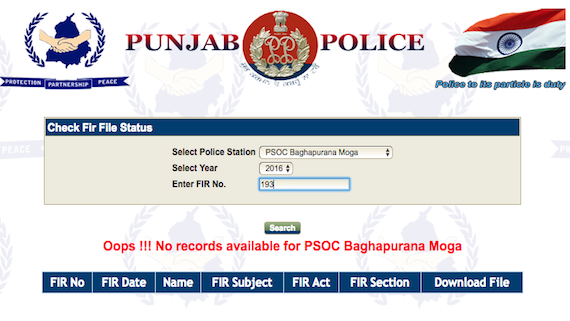 Sikh Siyasat News (SSN) checked the website of Moga police (punjabpolicemoga.gov.in/firstatus.htm) which provides online access to FIRs registered at various police stations under Moga district’s jurisdiction. The website hosts proceeding and following FIRs (numbered 192 and 194) registered at Baghapurana police station but it does not show up FIR number 193. “Oops !!! No records available for PSOC Baghapurana Moga“, reads a message which shows up when a query for FIR number 193/2016 registered at PS Baghapurana is submitted. Advocate Jaspal Singh Manjhpur, who appeared for Ramandeep Singh in the court today and is expected to appear for Jagtar Singh Johal tomorrow, said that he is also waiting to get the copy of FIR. “As per directions of the Supreme Court of India, it is necessary to upload copies of an FIR on police station’s online portal/website with in 24 hours of its’ registration but the Punjab police has not uploaded the copy of this FIR even after one year of registration”, he said. “It seem to be a deliberate ommission of a public document because proceeding and following FIRs registered at same police station are available but this particular FIR does not show up on police website”, he added. The family of Jagtar Singh Johal alias Jaggi issued a statement yesterday maintaining that they were being denied information about whereabouts of Jagtar Singh. The family added that they did not even know the charges against Jagtar Singh and they do not have access to the copy of FIR.